The UK launch of the first ever bespoke Brion Gysin Dreamachine“We must storm the citadels of enlightenment the means are at hand” William S. BurroughsThe dreamachine is a stroboscopic flicker device you view with your eyes closed that produces visual stimuli and hallucinations. 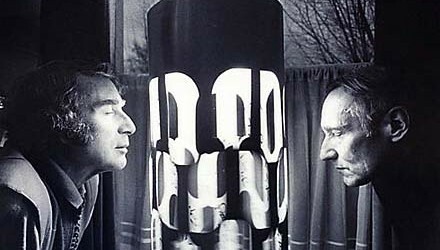 Gysin believed that by offering the world a drugless high the invention could revolutionize human consciousness. The night will include exclusive talks, film screenings, music, and Dreamachines! 40th Anniversary Festival in Joujouka an intimate portrayal of ritual and village life. Tribe Ahl Serif an intimate view of the classic Master Musicians of Joujouka shot 6 months before Ornette Coleman arrived to record in January 1973. Tribe Ahl Serif was filmed in June 1972 by John Anthony sound by Arnold Stahl. FLicKeR :: A Film By Nik Sheehan Featuring Marianne Faithfull, DJ Spooky, The Stooges, Iggy Pop, Lee Ranaldo, Genesis P-Orridge, John Giorno, Floria Sigismondi, and Kenneth Anger, Terry Wilson and others.James B L Hollands’s Telepathy 101 from hard drive as it flickers with a 60 frame per second intensity!! James B.L. Hollands is a video artist, musician and writer who currently lives in London. His work has shown at the Tate Modern, Whitechapel Gallery and Liverpool Biennial as well as numerous squats of equal importance. This entry was posted on 22 November, 2012 in homepage and tagged Apiary Studios, Bryon Gysin, dreamachines, Frank Rynne, guerilla zoo. Bookmark the permalink.